When Britain declared war on Germany on 4 August 1914, the 14th (King’s) Hussars was stationed at Mhow, India. The Regiment had arrived in India from England on 27 September 1906 and was serving as part of the Mhow Cavalry Brigade. The Regiment received orders to mobilize on 28 October 1915 while stationed at Meerut, to the north of Delhi. The 14th Hussars left India in November 1915 for Mesopotamia (Iraq) and landed at Basra the same month. The 14th Hussars served as part of the 6th Indian Cavalry Brigade until May 1918, when the Regiment left and moved to Persia (Iran). 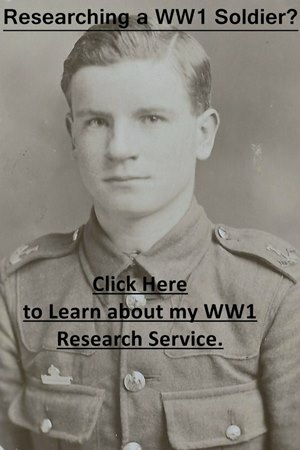 I have a number of Guides to Researching Soldiers who Served in the British Army in the First World War which you can look through. The guides on service and medal records are the most important if you’re starting out. Keep open my page on British Army abbreviations and acronyms as you will come across a lot. I would also recommend downloading the 15th Hussars’ war diaries which I have discussed below. Officers: Start by looking to see if a service record has survived at the National Archives (I offer a copying service) or if an officer served past April 1922 then it should be at the Ministry of Defence and this link will take you to my Second World War site: Ordering a Service Record from the MOD. Officers are frequently recorded in the Regiment’s war diaries and you can check an officer’s promotion information in the London Gazette and Hart’s Army List. Newspapers are a good resource to use when trying to find a photograph of an officer or information regarding a casualty. Other Ranks: First have a look for a service record, though many were destroyed in the Blitz. If a soldier served past January 1921 then the Ministry of Defence should hold the record and this link will take you to my Second World War site: Ordering a Service Record from the MOD. The war diaries of the 15th Hussars contain the names of over 100 soldiers looking through them. You can often work out an enlistment date from a soldier’s regimental number if their service record has been destroyed. To research a soldier who served in the 14th Hussars during the war you’ll need to search the records on FindmyPast and Ancestry. Both sites offer a free trial period and if you live in Britain, you can often access them at your local library. There are four war diaries for the 14th Hussars and all have been digitized by the National Archives. To download the war diaries for a small fee click on the blue links below. I have transcribed some of the entries from January 1917 at the bottom of the page. Notes: An average war diary in the most part though there are a few more detailed entries. The only appendix is a sketch map of the country between Sheikh Sa’ad and the Shumran Bend. Notes: A good, detailed war diary which also records the regiment’s casualties. There is a roll of officers who served with the 14th King’s Hussars during December 1917 and January 1918. There is also a strength return for the Regiment dated 1 January 1918. Also, a couple of maps of the area around Baghdad. Notes: A good war diary with lots of detail. There is a Memorandum on the Defence of the Bijar Position and a sketch of Takan Tappeh. Notes: Another good war diary with lots of detail. There are a number of interesting appendices including Notes on Local Persian Transport and a map of northern Persia. There is also a nominal roll of officers, warrant officers, non-commissioned officers and men transferred to Provisional Hussar Regiment, 7th Cavalry Brigade dated March 1919 and a nominal roll of the cadre of the 14th (King’s) Hussars from the same month. These two nominal rolls have in excess of 100 names on them. There is a very detailed regimental history: Historical Record of the 14th (King’s) Hussars from 1900-1922 by Brig. J. Gilbert Browne and Lieut.-Col. E. J. Bridges. This history has been reprinted by the Naval and Military Press. 7 January 1917: Bassouia: Left Arab Village 8.30 am marched via Twin Canals, Sinn and Atab to Bassouia arriving there at 4.30 pm. The camp had been laid out in the wrong place and considerable delay was occasioned. Transport arrived 9 pm. Fine day, fog at night. 8 January 1917: Bassouia: In camp. Orders received to March to Bgailah (25 miles upstream from Kut) at 6.50 pm. Thick fog came down at 6.15 pm. Column moved off at 6.30 pm proceeded 4 miles and returned to camp as it was found impossible to move owing to the fog. 9 January 1917: Bassouia: Foggy till 2 pm. Orders again received to march to Bgailah at 6.30 pm but cancelled at 5.45 pm. 10 January 1917: Zenabiah (near): Left Bassouia 7 am and marched to near Zenabiah (en route to Hai Town) arriving there at 5.00 pm. Much delay was caused as the Shib Gussab canal had to be bridged. Fog till noon, fine afterwards, some rain at night. 11 January 1917: Hai Town: Arrived Hai Town, 12 noon having met with no opposition en route. Several Arab shelters were looted and 15,000 rounds of Mark VI ammunition were found in one. At 12.30 pm one of our aeroplanes flew over us and dropped 4 bombs, killing 1 man of 6th Machine Gun Squadron and causing a stampede of their horses. Camped 1 mile East of the town. Cloudy, some rain. 12 January 1917: Hai Town: In camp, collecting grain etc. 13 January 1917: Hai Town: In camp, 80 rifles and a large quantity of ammunition was found and destroyed. Fine. 14 January 1917: Dujailah Depression: Left Hai Town 6.30 am. Inhabitants turned out and fired on the rear guard, 1 squadron 22nd Cavalry and caused delay. One of our aeroplanes made a forced landing near Zenabiah and had to be burnt. Marched 32 miles via Atab and camped at Dujailah arriving there 10.15 pm. 15 January 1917: Arab Village: Left Dujailah 9 am arrived Arab VVillage12 noon. Lieut. and Quartermaster Best and 2/Lieut Woodhouse joined from India. Fine. 16 January 1917: Arab Village: In camp. Fine some rain at night. 17 January 1917: Arab Village: In camp. Fine. 18 January 1917: Arab Village: In camp, fine 13th Hussars and 22nd Cavalry on reconnaissance towards Pusht-I-Kuh. 19 January 1917: Arab Village: In camp. Fine. 20 January 1917: Arab Village: In camp. Fine. Orders received at 2 pm to march next morning at 6 am. These orders were cancelled at 7.30 pm. 21 January 1917: Arab Village: In camp. Orders received at 11 am to march to Dujailah at 5.30 pm. Orders again cancelled at 3 pm and at 5 pm more orders issued to march at 6 am on 22nd to Bedrah. Fine but cloudy. 22 January 1917: 4 miles south of 28 wells: Left Arab Village at 6.30 am and marched to Wadi, North of Fort Yakub, watered and fed and proceeded to a point 4 miles south of 28 wells. The going here was very bad several guns and waggons becoming stuck in the mud and bog. Darkness came on and they were only extricated with great difficulty. Bivouacked on a piece of firm ground at 9.30. Rained steadily all night. 23 January 1917: Fort Abdul Wahab: Left bivouac 7 am and marched towards the Wadi. Several vehicles again sunk in bog causing delay. Bivouacked at Fort Abdul Wahab at 1.30 pm. A supply column was sent out from Arab Village. Fine day. Some rain at night. 24 January 1917: Arab Village: Left Fort Abdul Wahab at 6.30 am arriving in camp at Arab Village at 2.30 pm. Fine. 25 January 1917: Arab Village: In camp. Fine. 26 January 1917: Arab Village: Marched at 7.30 pm to Sinn Aftar. Following officers remained at Arab Village: Lieutenants Mole, Hamer, Macintyre, Woodhouse also 72 men and NCOs. Marching out strength 432. Fine. Cold night. 27 January 1917: Bassouia: Arrived Sinn After 1.30 am and bivouacked. Left at 5.30 pm and marched to Bassouia arriving there 10.30 pm. Transport arrived 4.30 am on 28. Fine. 28 January 1917: Bassouia: In camp. Fine. 29 January 1917: Bassouia: Marched at 9 am to a point south of march west of Bassouia in support of the 13th Hussars who were carrying out a reconnaissance of enemy trenches. North of the marsh. Returned to camp 4 pm. Fine. Hot day. 30 January 1917: Bassouia: Marched 5 am to Maherja arriving at 10 am. Slight Arab opposition delayed the advanced guard. 500 head sheep, cattle and goats and 1600 maunds of barley collected and brought back to camp. “C” (Capt Bridges) rear guard on return to Bassouia. Arabs followed up. Reached camp 7.30 pm. 1 man slightly wounded. Fine. 31 January 1917: Bassouia: In camp. Rain during night 30/31. Fine but cloudy.